The Giottos Microfiber Lens Cleaning Pouch is a unique and effective way to keep your lenses and other optics safe and free from nasty contaminants. More than just a cleaning pouch, you can use these handy bags as storage cases. They come with a drawstring to close the top and keep harmful dust and grime off your gear. Box Dimensions (LxWxH) 5.4 x 4.5 x 1.9"
CL3632 Microfiber Lens Cleaning Pouch (4.7 x 7.9") is rated 4.4 out of 5 by 13. Rated 5 out of 5 by FD from Wasn't sure what to expect I was looking for a soft, inexpensive bag to put my Rolleiflex TLR into when it's in a camera bag and not in its leather case. This one seemed to fit the bill both in size and price. I have to say the bag is way nicer than I was expecting. 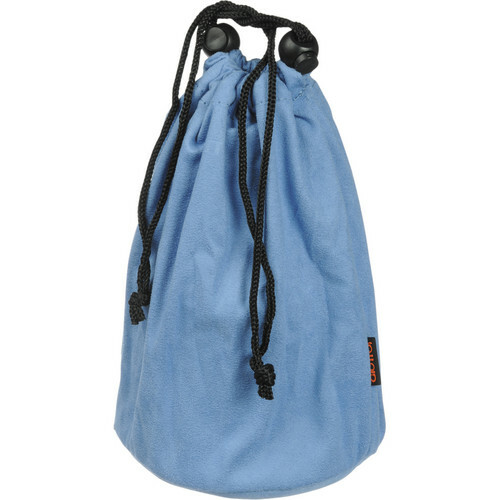 It's super-soft, seems very well made and has a nice flat bottom like other lens bags. The 'Flex fits perfectly within the 4.7x7.9 bag. This then allows me to place it within a larger padded camera bag knowing that the camera will be protected from scuffs. I wasn't looking for a heavy, padded bag for my uses, so if you need something stout to protect your gear this probably wouldn't be the bag for you. Rated 5 out of 5 by Jack from Works as stated. The new microbivers are great. Cloth cleans and then can be washed and used again and again. Rated 5 out of 5 by Scotty K from EXCELLENT! I Bought this product to store some extra lens in for trips. Excellent quality and build. Rated 5 out of 5 by Anonymous from Great product This lens pouch is great for protecting an extra lens in my camera bag. Rated 4 out of 5 by birdsrus from What did I buy? When it arrived my reaction was, what did I buy. I unwrapped one and it was large cumbersome and ugly. The other two were hidden in the cupboard. However the next trip I went on, I decided to pack some of my camera bits and pieces into one. Response you ripper! Unpacked the other 2 and packed them with other loose kit. So what at first i thought was a lemon is now a very valuable travelling solution. Rated 5 out of 5 by Gina from Great Quality This is a larger bad than I thought it would be. I bought it to hold the Giottos rocket blaster, pec-pads,tiffen lens cleaner, the goat hair brush. It holds all these things a I still have plenty of room to fit another object of the size of the pec-pads. Very soft to the touch and has a nice padded bottom. Plus this bag will come in handy if I need to clean my lens out in the field. Rated 3 out of 5 by Prof G from Not what I had in mind I was excited when I saw a lens pouch that was also a lens cleaner. I saw it was something that could both protect my lens and clean it also. However, it was thinner than I thought it would be and won't quite provide the protection I would like. I will use it to clean my lenses, but I will purchase a sturdier pouch in the future. Rated 4 out of 5 by Cam from Nice Product I use this to store and clean my camera lenses. Haven't used it too much as of yet, but what I've seen so far is great. It's got a padded bottom to protect the lens. The only downside is that you can just crush up the bag and stick it in your pocket when you want to. Other than that, great product.